If you ever want to have gear that will get you into the end game content on World of Warcraft, then you’ve got to farm for gold. You’ll need gold to buy crafted gear and purchase materials to get it enchanted. You’ll also need plenty of gold to purchase the gems that will make your gear even better. Of course not everyone knows how to make gold, but the dungeon finder makes it easy to have plenty of gold by the time you reach level 85. On the most basic level, instance leveling will allow you to make a large amount of gold in a short amount of time. Just as your character will level faster through the dungeon finder, you’ll also have access to more gold. It’s much faster to kill large mobs with four other people than it is to grind away by yourself, killing one monster at a time. You’ll be able to cram a lot more kills into a short amount of time when you’re working with four other people. More kills mean more gold dropped, more trash that can be sold to the vendor, and overall better gear for your character. Better gear means less gold spent on gear that will only last you for a level or two. Another important part of farming gold by instance leveling is all the enchanting materials you have access to. Of course the “disenchant” option will only be available in your instance group if you have an enchanter, but there are enough enchanters around that you will often enough. Every time a piece of loot drops that you can’t use, just click the “disenchant” option if it’s available. This selection will allow you to roll on the materials that come from the item after it’s disenchanted. Rolling on the “disenchant” item is equivalent to rolling “greed,” but it’s a great way to get your hands on some enchanting materials if you’re not an enchanter. The great thing about enchanting materials is that they will almost always sell on the auction house. 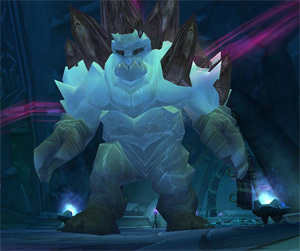 Enchanting is known to be one of the most expensive professions to level on World of Warcraft. This is because the materials go for top dollar on the auction house, and the best way for non-enchanters to get their hands on gold available from selling enchanting materials. Even enchanters will appreciate instance leveling because more kills in a shorter amount of time means more loot that can be disenchanted. Another important thing to remember about instance leveling is the access to cloth materials. Once again, more kills means more loot, and within that loot there will be a lot more cloth than what will drop when you’re leveling alone. Cloth is an important part of making enough WoW gold, so just save up all your cloth materials and sell them on the auction house. You’ll get quite a bang for your cloth.